This week the #Arras95 project has been commemorating the 95th Anniversary of the Battle of Arras, fought in Northern France. 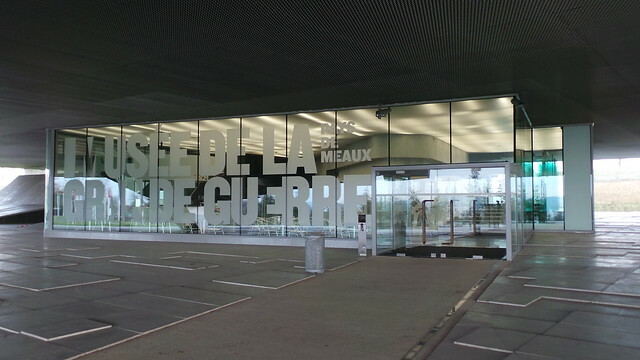 But Arras is not the only major battle fought during this week 95 years ago; at the same time General Robert Nivelle was commanding the French Army into action on the Chemin des Dames. The Chemin des Dames – or ‘Ladies’ Way’ – was a road than ran across an area of high ground north-west of Reims. 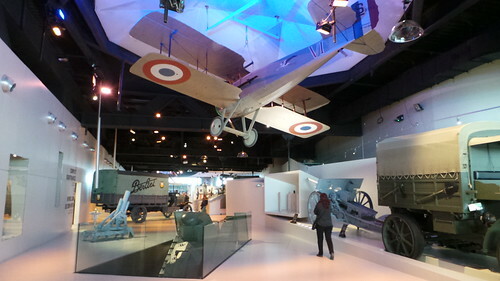 It had been taken by the Germans in 1914 during the Battle of the Aisne and the offensive was a combined operation with the British attacks at Arras. 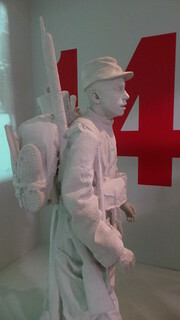 Nivelle’s objective was to crush the German defences on the Chemin des Dames and destroy their dominance of the battlefield – all within a time frame of 24-48 hours. 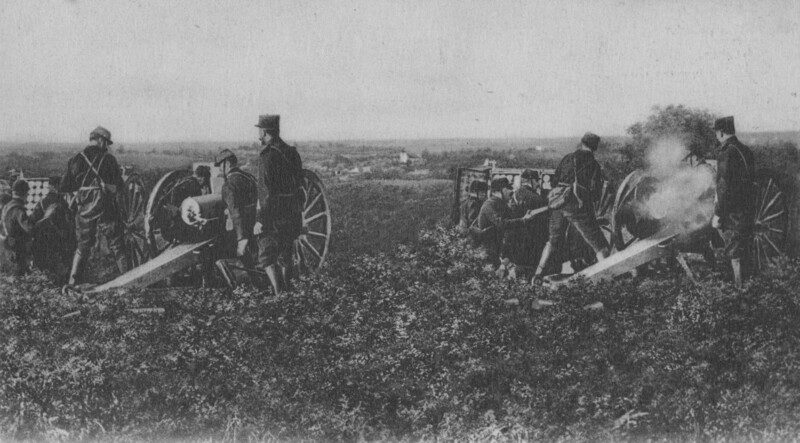 Sadly from the start things went badly; in the opening of the attack on 16th April 1917 French armoured forces took heavy losses on the right flank losing more than 150 tanks and the bombardment proved ineffective with substantial casualties among the infantry; 40,000 casualties alone in the first day of operations. The battle continued beyond the planned 48 hours into early May as gradually the French forces made some gains on the high ground but at huge cost. The offensive partially led to the mutinies in the French Army and ended Nivelle’s career as a commander. 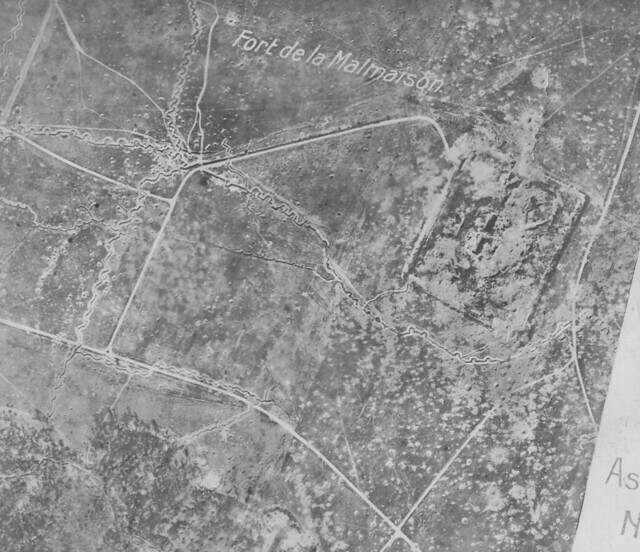 This aerial image is from a small collection showing the battlefield across the Chemin des Dames around Fort de Malmaison in April 1917. WW1 French aerial images are very large – almost A3 size – and of a very high quality; a huge amount of detail can be picked out on them. Fort de Malmaison was built in 1877 and was in fact abandoned by 1914. Captured by the Germans in 1914 they used it until the battle crept close in 1917 but the Nivelle Offensive failed to reach it and there was only serious fighting here in October 1917. After WW2 the area in front of the fort was chosen for a WW2 German Cemetery but the ruined remains of the fort were fenced off for many years; now a group of volunteers regularly conduct tours of the site. A larger version of the aerial photo can be viewed here. 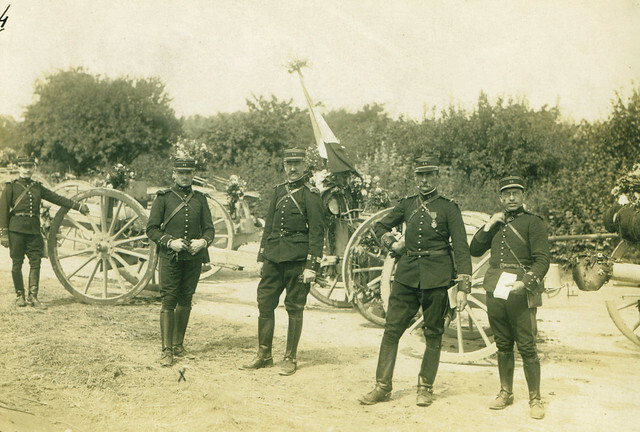 Today we feature some more photos from the Lauder album, taken by a young women who travelled to the battlefields between Reims and Verdun in 1925. 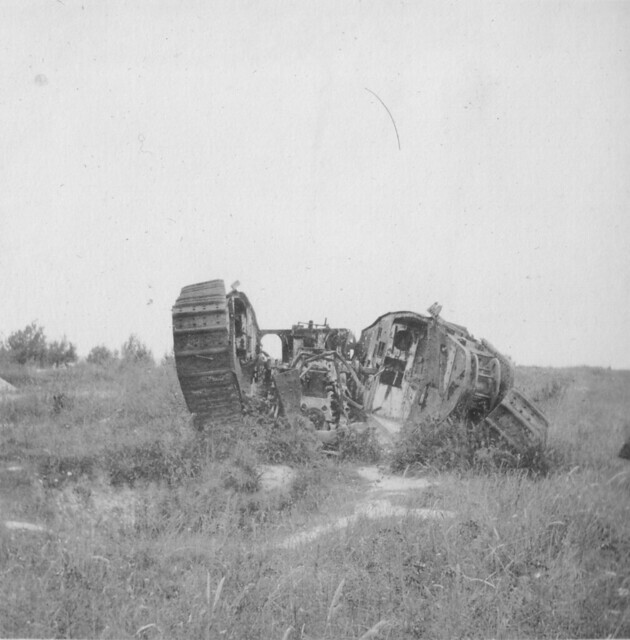 These images show some knocked out tanks which were then visible close to Fort La Pompelle, just outside Reims. The fort had been on the front line for four years during the Great War but had never fallen. 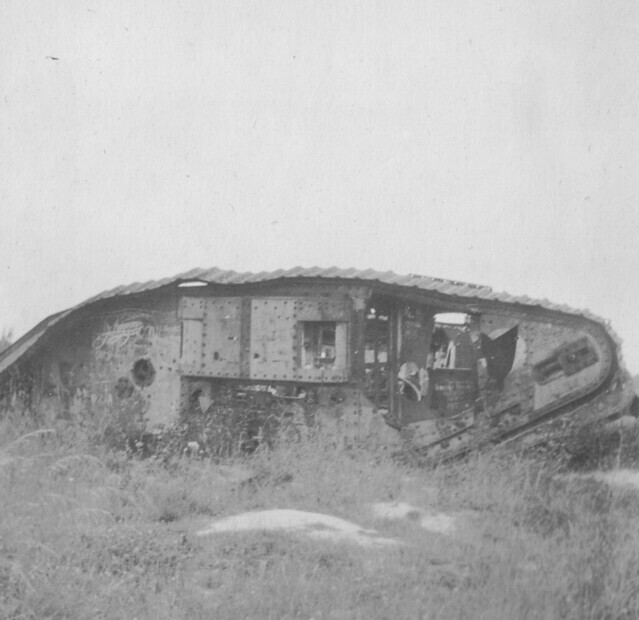 In June 1918 a German attacked was launched on the fort which included a large number of captured British Mark IV tanks (largely taken at Cambrai) being used by the German Army, painted in their own colours and given German names. 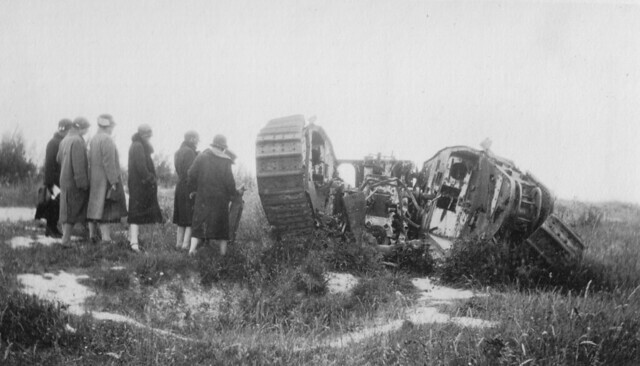 The wrecks of the tanks knocked out here in June 1918 became tourist attractions post-war and remained here until they were scrapped by the Germans during the occupation of WW2. The Lauders were some of thousands who visited these wrecks in the 1920s and 30s.